The story of an old timer’s summer fishing trip on the Pacific coast of Canada is told in cartoon format in this nostalgic look at a disappearing lifestyle. Just as he has done for years, Gubby leaves his wife in the seaside village in which they make their home, and heads north in his 36-foot salmon troller, Flounder, with only his cat Puss as crew. Multiple detailed illustrations on each page tell much of the tale, with a few lines of narration and the characters’ speech bubbles filling in the storyline. Gubby navigates rapids and rough seas, visits with other fishermen in harbours along his route, and ends up on the fishing grounds on the west coast of Vancouver Island. Eating beans on toast and drinking orange pekoe tea, and rarely leaving the confines of his little boat, Gubby’s life as a fisherman is spent in the company of the crews of other fishboats and the occasional pleasure craft that he happens to tie alongside. 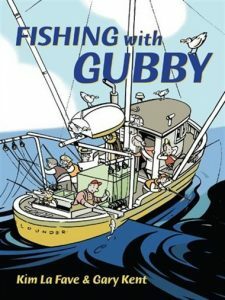 Fishing with Gubby would work well with other picture books like Hold On, McGinty and Duncan’s Way to teach students of any age about the lives of Canadian fishermen and how things have changed since what some call “the golden age” of fishing on Canada’s coasts.